This cake was made from scratch, using my lemon sponge cake recipe. It is frosted with vanilla buttercream also made from scratch. I used three 6 inch rounds, stacked without using any supports, it held up beautifully. 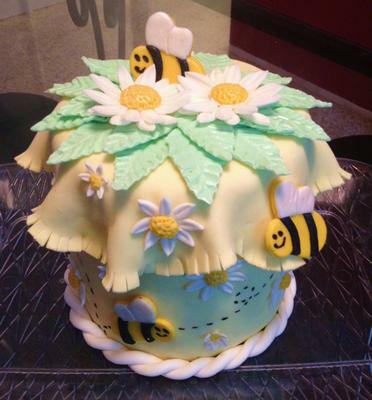 All decorations are made from fondant, I had daisy cutters, a cute little bee cutter, I cut strips of black fondant for his stripes, and hand cut the wings to fit. The leaves were made using fondant tools for the veining. I attached all decorations with a gum glue. I used a edible marker to draw on his happy little face. It was adorable and delicious!! !